TOKYO, Sept 4, 2011 (AFP) - The death toll from Typhoon Talas rose to eight in western Japan with another 33 missing after the powerful storm brought heavy rains and fierce winds to the region, a report said Sunday. Talas, which made landfall on Saturday, packed gusts of up to 108 kilometres (68 miles) per hour, flooding rivers and causing landslides as it cut across the main island of Shikoku and the western part of Honshu island. 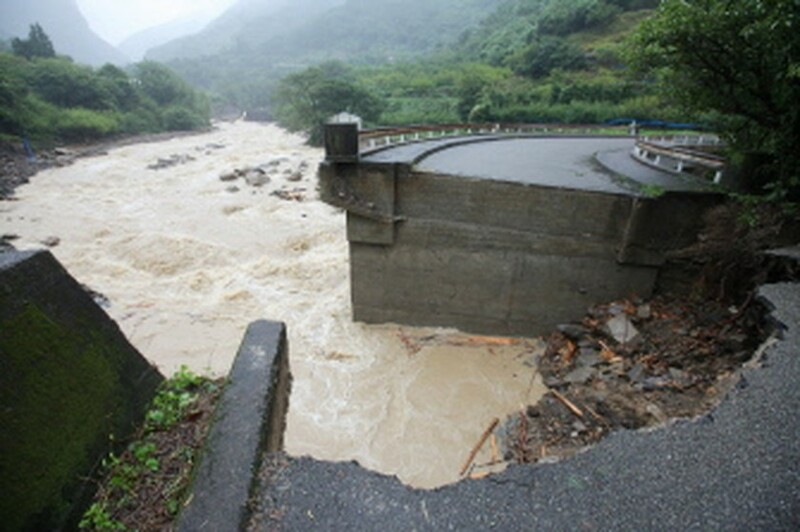 AFP - This handout picture taken by Nara prefectural police on September 4, 2011 shows part of a road washed away during heavy rains in Tanabe city in Wakayama prefecture, western Japan. Typhoon Talas cut across western Japan September 3. Public broadcaster NHK reported at least eight people died and 33 were missing, while another 94 people were injured. The powerful typhoon was slowly moving north into the Sea of Japan (East Sea) on Sunday morning, the Japan Meteorological Agency said. In Nara prefecture's Totsukawa village, a gushing river washed away housing complexes, leaving at least two people dead and seven missing, the local government said. Officials in Wakayama prefecture reported three people dead and 10 missing.